Meeting was called to order by Mayor Brian Linin with Vice-Mayor Anette Fairbanks, Commissioner Gary Farris, Commissioner Gwen Mai and Commissioner John Garcia responding to roll call. Also present were Rich Simon – Public Works Superintendent, Joni Showalter-Police Chief, Sami Philbrick- Museum Director, Alex Weis- Code Enforcement, Sharmis Blake- Deputy City Clerk and Andrew Finzen – City Manager. EagleMed – Nate Brown representing EagleMed discussed the membership program for AirMedCare Network. Nate stated, it is a great benefit to offer your employees. The primary reason for membership is to cover all out of pocket costs if someone in your household should ever need air ambulance service with EagleMed. 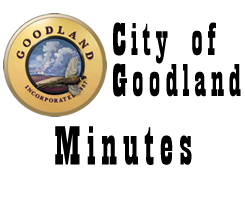 We have been in service for thirty-five years and located in Goodland sixteen years. Annual membership price would cost the employer $55 for each employee. At this time, network coverage spans across thirty-two states and includes over two hundred sixty air ambulance bases with three million members. Andrew stated, at $55 per employee, City cost would be approximately $3,040.00 per year. Vice-Mayor Fairbanks stated, this coverage is something the Commission should think about for the employees. KMEA Board of Directors – Andrew stated, the City is a member of Kansas Municipal Energy Agency (KMEA). According to KMEA bylaws, each member is required to have two Directors and one Alternate on its Board of Directors. Current Director #1 Dustin Bedore and Alternate Lukas Wolak have terms that expire April 30, 2017. I recommend they be reappointed to board. ON A MOTION by Commissioner Garcia to reappoint Dustin Bedore as Director #1 and Lukas Wolak as Alternate Director to the KMEA Board of Directors seconded by Commissioner Farris. MOTION carried on a VOTE of 5-0. Board of Zoning Appeals – Andrew stated, Dean Graber serves as a member of the Board of Zoning Appeals with his term expiring February 2017. I recommend Dean be reappointed for another three-year term. ON A MOTION by Vice-Mayor Fairbanks to reappoint Dean Graber to the Board of Zoning Appeals for a three-year term seconded by Commissioner Mai. MOTION carried on a VOTE of 5-0. Planning Commission – Andrew stated, Adam Dees serves as Chair for Planning Commission with his term expiring January 2017. I recommend Adam be reappointed for another three-year term. ON A MOTION by Commissioner Garcia to reappoint Adam Dees to Planning Commission to a three-year term seconded by Commissioner Mai. MOTION carried on a VOTE of 5-0. Housing Authority Board – Andrew stated, Shelia Barnett from the Goodland Housing Authority is recommending Tracy Hillmer be reappointed to the Housing Authority Board for a four-year term. ON A MOTION by Commissioner Garcia to reappoint Tracy Hillmer to a four-year term on the Housing Authority Board seconded by Commissioner Farris. MOTION carried on a VOTE of 5-0. Museum Board – Andrew stated, Sami is recommending Jessica Vignery be appointed to the Museum Board for a three-year term. ON A MOTION by Commissioner Mai to appoint Jessica Vignery to a three-year term to the Museum Board seconded by Commissioner Garcia. MOTION carried on a VOTE of 5-0. Street Bond Financing – Andrew stated, financing for the street improvement project is estimated at $2,240,000, which is sufficient to cover project costs estimated at $2,160,000. Sherman Street from 14th through 17th Street is a priority. Rich stated, with the water projects these streets need repaired in a timely manner. The Industrial Park road extension could be included as a bid alternate should bids come in lower than expected. Andrew stated, this is not the final action but I need approval to begin financing paperwork for the project. ON A MOTION by Vice-Mayor Fairbanks to approve Andrew proceeding with the financing documentation for the street bond project seconded by Commissioner Mai. MOTION carried on a VOTE of 5-0. Authorization of City Manager to sign LWCF Assurance Statement- Andrew stated, the City previously utilized a Land & Water Conservation Fund Grant to make improvements in the Steever Water Park area. I am requesting authority to sign this agreement. ON A MOTION by Commissioner Garcia to approve Andrew Finzen signing the LWCF Assurance Statement seconded by Commissioner Farris. MOTION carried on a VOTE of 5-0. Award of Administrative Car Bid – Andrew stated, the car provided to the City Manager was totaled in last year’s hailstorm. The City has $19,000.00 in reserve to purchase a new vehicle. We received both new and used bids with the apparent low bid from Herl Chevrolet on a 2011 Impala LS. The Jeep used by Code Enforcement and staff to attend meetings needs replaced. Herl’s presented a bid to trade in the Jeep for a 2015 Impala. The total cost for both vehicles is $17,500.00. ON A MOTION by Commissioner Mai to approve purchase of the 2011 Impala and 2015 Impala from Herl Chevrolet and trade in Jeep for total cost of $17,500.00 seconded by Vice-Mayor Fairbanks. MOTION carried on a VOTE of 4-1 with Commissioner Garcia casting the dissenting vote. Unfit Structure: 1008 Main Street – ON A MOTION by Vice-Mayor Fairbanks to proceed with process for unfit structure at 1008 Main seconded by Commissioner Garcia. MOTION carried on a VOTE of 5-0. Unfit Structure: 104 College Street – ON A MOTION by Commissioner Mai to proceed with process for unfit structure at 104 College Street seconded by Vice-Mayor Fairbanks. MOTION carried on a VOTE of 5-0. Unfit Structure: 1529 Broadway – ON A MOTION by Commissioner Garcia to proceed with process for unfit structure at 1529 Broadway seconded by Commissioner Mai. MOTION carried on a VOTE of 5-0. Unfit Structure: 1619 Kansas – ON A MOTION by Vice-Mayor Fairbanks to proceed with process for unfit structure at 1619 Kansas seconded by Commissioner Garcia. MOTION carried on a VOTE of 5-0. Unfit Structure: 602 Clark – ON A MOTION by Vice-Mayor Fairbanks to proceed with process for unfit structure at 602 Clark seconded by Commissioner Mai. MOTION carried on a VOTE of 4-1 with Commissioner Farris casting the dissenting vote. Unfit Structure: 811 E. Hwy 24 – ON A MOTION by Commissioner Garcia to proceed with process for unfit structure at 811 E. Hwy 24 seconded by Vice-Mayor Fairbanks. MOTION carried on a VOTE of 5-0. City Managers Report- 1. Police Department Law Enforcement Trust Fund Forfeitures Annual Report – Andrew referenced Commission to report in packet. Joint Commission Meeting – Andrew reminded Commission of Joint Commission Meeting with County Commission February 7th at 5:00 p.m. in the Commission Room. 3. A reminder that the City is closed February 20th for Presidents Day; next Commission Meeting is Tuesday February 21st. 4. City wide cleanup is scheduled for first week of May. Vice- Mayor Fairbanks – 1. I have had requests to find a shredding company come to town. It might be a good idea to have during clean up week so citizens can bring their private papers to shred. 2. Citizens have contacted me about Finley Construction not having a current contractor license. Mayor Linin has discussed the situation with Brian and Alex. The City requires the contractor to pass an open book test. Andrew stated, this is following our code, if you make exceptions; it gives some an unfair advantage. ADJOURNMENT WAS HAD ON A MOTION by Commissioner Garcia seconded by Vice-Mayor Fairbanks. Motion carried by unanimous VOTE, meeting Adjourned at 6.30 p.m.